Can someone give me a nice reference of the raising of incense ritual, and does anyone have nice pictures of a church where the thurible is plainly visible? I'd like a nice reference of it. Finally, this photo doesn't show the thurible in action, but just look at all that incense! 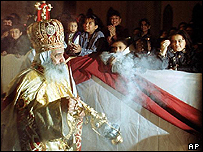 As a non-Orthodox, the one thing that stands out in my mind about the Coptic Orthodox Church is the generous use of incense. In my Catholic diocese, incense has largely fallen into disuse at most parishes. :'( You may be lucky to see a few token puffs of incense during Easter Sunday Mass. You could consider yourself even luckier if you see the old thurible dusted off and used on Christmas day! im assuming thurible means same as censor? anyway i hope to see ur book when u finish!!! will u promise to show us or tell us details of where its sold or somethin like that? im ***uming thurible means same as censor?